ALL DAY BUFFET is a new not-for-profit organization that will create on and offline social outlets for young adults combining social action with arts and culture. The organization is called ALL DAY BUFFET and while it has nothing to do with food, it has almost everything to do with hunger. As a new social network for social change, the aim is to motivate young adults to recognize problems in the world, learn about them, and act together to make a difference, while having a lot of fun at the same time. Tonight is ALL DAY BUFFET's pre-launch event which features The Human Trafficking Project. Download the new Human Trafficking Project Overview. Show your support for young people working to make a difference. Where: Triple Crown, located at 108 Bedford Avenue (at North 11th Street), Brooklyn, NY 11211. The first stop out of Manhattan on the L train (Bedord Ave). 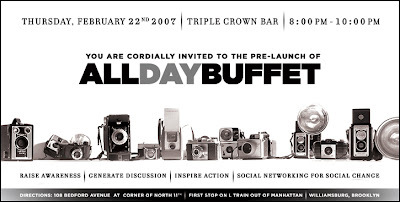 Learn more about ALL DAY BUFFET.